So, first things first, let’s define what I mean by newsletter. If you’re old enough (ahem), the word likely brings to mind a folded four-page paper newsletter that you got monthly in the mail from say your church, community, or other groups. It featured announcements, meeting dates, and maybe even a member spotlight. It was how we kept in touch before Facebook groups and Slack revolutionized how we communicate. Excellent! Neither do I, so let’s simplify the idea of a newsletter. All I want you to do is regularly send something to your subscribers checking in with them and reminding them who you are and what you do. 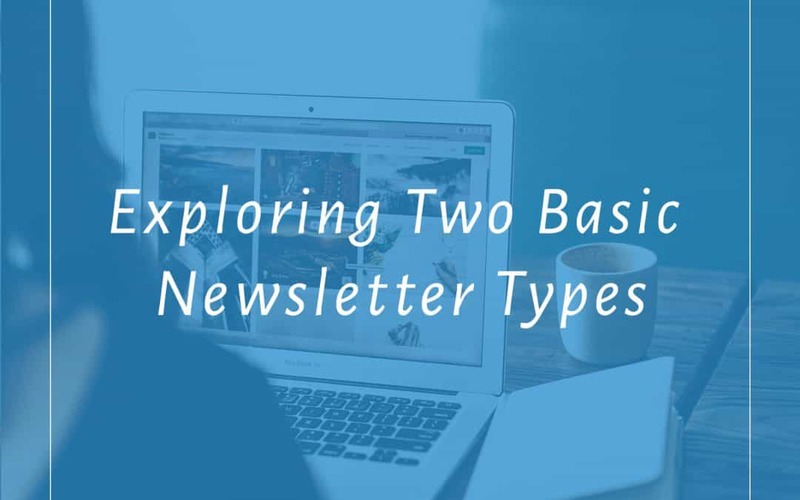 There are two main ways you can do this: a curated content newsletter or an exclusive content newsletter. Make it personal! – Don’t just drop a link to your latest blog post and run. Write 2-3 lines that are from YOU. It doesn’t have to be a novel, but make that personal connection with your subscribers and remind them that there’s a real live person behind your brand. It can be a blurb about what you’re reading, what’s going on in your life (that’s at least semi-relevant to your niche), or a peek behind the scenes. Recycle your content. – Let them know where you’ve been around the web lately or where you’ll be soon. Link to a recent Facebook post that’s been interactive, a recent guest post you’ve done, or tell them about an interview on a podcast that’s recent or upcoming so they can tune in. Include a clear Call to Action. – The point of an email list is to get them back to your site to take an action on something. Share your content, book your service, buy your product. Keep the promotional part of your email to about 10%, but make it clear and don’t give too many CTAs. Share the spotlight. – Feature a customer or community member. It serves as both a testimonial for you and spreads the love to your community. They’ll appreciate being featured, and it boosts your Know<Like<Trust factor all around. Not every week needs to contain all of these items, but your subscribers will appreciate consistency. The great thing about this type of newsletter is that you aren’t having to sit down and come up with brand new, extra content. You’re curating it from things that already exist. Once you have a template going, you can knock this out in 20 minutes easy. Essentially, this type of newsletter is like writing a blog post that only goes to your subscribers. This can be as simple as a behind the scenes feature or as involved as a free resource that is only available to subscribers. I like to write these for our lifestyle blog, Big Family Minimalist, as it allows me to share more personal facets of our journey with our subscribers that allows me to really connect with our follows and not have to worry about it being “polished” for a public blog post. Your exclusive content will depend on your business, but it can be a place to get a little vulnerable or something that packs a punch of extra value for your customers. The exclusive content route is definitely a lot more involved than the curated content version, but the payoffs can be massive when it comes time to pitch them a product or service. By turning out exclusive content on a weekly basis, you’re training your subscribers to expect great resources from you. If you launch a new course after 2-3 months of sending weekly exclusive content on top of the other content you’re putting out on your blog and other channels, they will click and buy without hesitation because you’ve established both your expertise and your quality of work with them. That said, I suggest going the exclusive content route only if busting out content is a strength of yours and you know you can commit to the extra work. If you’re producing 2-3 blog posts, a weekly YouTube video, regular social media content, and then adding on exclusive content for your list, you’ll burn out quickly if you don’t have methods and systems in place to make sure it all gets done. We’ll talk more about that soon! Sending a consistent and frequent newsletter is important to the health of your list and you can read more about why in this post. If you think it’s too much work or too complicated, you need to scale back and choose a method that makes it simple. Don’t be afraid to create and use a curated content template. Anything sent out regularly is better than sending nothing until you’re ready to pitch your new product or service. Want even more tutorials and productivity hacks? Subscribe now and you'll get my best tips, tricks, and tutorials each week right in your inbox.